I had a good segment on WBT in Charlotte with Tara Servatius on Friday afternoon talking about Pat McCrory's potential gubernatorial campaign. We talked about some pretty standard stuff I've been blogging about- in the primary McCrory isn't showing much strength outside the Charlotte tv market, he's going to need a better message than cities are getting the shaft, he has more of a shot at getting Democratic votes in the general election than the other Republican candidates. Basically the bottom line being that he looks like the strongest GOP candidate in the general election, but is his reputation as a moderate going to keep him from being able to get through a primary dominated by conservative voters? Tara asked me one question though that caught my attention. Are there enough Republican primary voters in the urban areas of North Carolina that the numbers would stack up well for McCrory even if he does poorly in rural North Carolina? I don't think so but I'll take a closer look at the numbers from the 2004 Republican primary later this week. You can listen to the podcast of my interview here. Choose the Jeff Katz show (Tara was guest hosting) and then the 4 PM hour from Friday. I was on from about 4:05-4:25. Another thing I'll take a closer look at later this week is the growing perception that the War in Iraq is being eclipsed as the most important political issue in the country. A new AP/Yahoo poll says that's the case. I'll take a look at what issues folks in North Carolina are thinking about and what candidates that might benefit next year. For now though, Happy New Years! A lot of pundits seem to be taking it for granted that senator Robert Pittenger will win the Republican nomination for Lieutenant Governor over former Congressional candidate Greg Dority. Carter Wrenn wrote about it here on the Talking About Politics blog and a comment on the Under the Dome blog mentioned it here. Certainly on paper it seems like an elected official from one of the largest cities in the state would have an easy time in the primary with someone whose main political experience is losing campaigns. It seemed the same way in the 2004 Republican Lieutenant Governor primary when Durham City Councilman Thomas Stith faced off in the primary against Jim Snyder, best known for getting 14% in a quixotic bid for the Republican Senate nomination against Elizabeth Dole in 2002. Snyder demolished Stith, getting 51% of the vote to Stith's 22% Even another fringe candidate got 27%. Weird things happen in races that voters don't know anything about. Pittenger will probably get the nomination, but not if he doesn't take it seriously. Our first poll showed Dority leading 16-15. The region including the Triangle and its surrounding counties will be pretty supportive of Democratic candidates next year, according to recent surveys conducted by Raleigh’s Public Policy Polling. Republican candidates are particularly likely to take a hit if native son John Edwards is at the head of the ticket. Public Policy Polling has conducted monthly polls in 2007 about the various statewide races we will have in North Carolina next year. One of the ways we analyze our results is by region, so as we enter 2008 it seems worth taking a look at the attitudes of voters in the Triangle and its surrounding counties about next year’s candidates. On the Democratic side support has been split pretty evenly between Hillary Clinton, Barack Obama, and John Edwards for President in the Triangle. Obama led the December poll in the region, while Edwards led in November, and Clinton led in October. The three candidates have been closely matched in all of the polls. For the Republicans Fred Thompson was the front runner for most of 2007 but saw his performance drop off in conjunction with the rise in support of Mike Huckabee over the last month or so. Huckabee now leads the area 29-19 over Thompson, with Rudy Giuliani close behind at 17%. When it comes to the general election though it doesn’t appear to matter who the Republican candidate is when it comes to garnering support in the Triangle. Edwards, Clinton, and Obama all lead potential match ups with the three Republican front runners (Mitt Romney in addition to Huckabee and Giuliani.) Edwards’ performance is especially strong in his home region as he leads all of the GOP contenders by over 20 points. His margin against Giuliani is 58-34, against Huckabee it’s 56-35, and he has a 56-33 advantage over Mitt Romney. Barack Obama fares strongly as well, earning more than 50% support against all three Republican candidates even with the undecideds factored in. Hillary Clinton’s performance, while strong, is the weakest of the possible Democratic nominees. Her leads range from just two to five points. In the gubernatorial primary, Bev Perdue appears to be the candidate of choice for Democrats in the Triangle. She has led Richard Moore by solid margins each of the last three months. For the Republicans, senator Fred Smith of Johnston County has taken a strong lead both within the region and statewide over the last few months after trial lawyer Bill Graham of Salisbury had led for most of the year. The Democratic candidates have the edge in all eight potential match ups against the four possible Republican nominees for Governor (Charlotte mayor Pat McCrory and former supreme court judge Bob Orr in addition to Smith and Graham.) What sets the Triangle apart from the rest of the state though is that Richard Moore actually has larger leads against the GOP candidates in the region than Bev Perdue does. Although they both lead every possible match up Moore’s margins are larger. In the rest of the state Perdue does better than Moore. We have also been polling in races further down the ballot, one of which is the race for the Democratic Treasurer nomination. Senator Janet Cowell of Wake County is seeking that office and has been basically tied statewide with David Young, a county commissioner from Buncombe County. In her home region though Cowell has performed very well, leading Young 20-12 and 21-12 in the Triangle for the last two polls. She’ll need a high percentage of the vote here to help her to victory in what is likely to be a pretty close race. The election is a long way off but as Democrats try to win the presidency in North Carolina for the first time since 1976 it appears the Triangle will be one of the most helpful regions of the state for reaching that goal. If they can maintain their current level of support over the Republicans and do an effective job getting out the vote in this part of the state it could make for a historic election year. -Laura Leslie over at WUNC has a good write up on the Rasmussen poll I wrote about here and here. Basically it had a bit of a rightward slant to it and she gives some of the background and specifics about it. Check it out here. -I'll be on WBT, 1110 AM in Charlotte, tomorrow at 4 PM talking about Pat McCrory and the Governor's race with host Tara Servatius. Check it out. -Over at Dome, Ryan has the word that Walter Dalton has agreed to participate in two debates. Since I criticized him for not engaging last week it's only fair that I give him credit for doing it in this case. Good job. -If you haven't been reading our year in review columns you should. Check out the one about the greater Charlotte region in today's Charlotte Observer, the one about the Sandhills and southeastern North Carolina in the Fayetteville Observer, the one about the Mountain political scene in the Smoky Mountain News, and the one about eastern North Carolina in the Outer Banks Sentinel. Thanks to all the papers that have printed them so far. The Republican presidential nominee will win the Sandhills and southeastern North Carolina by a good margin unless John Edwards is the Democratic nominee, according to recent surveys conducted by Raleigh’s Public Policy Polling. Republican candidates for Governor would also be strongly favored in the region. Public Policy Polling has conducted monthly polls in 2007 about the various statewide races we will have in North Carolina next year. One of the ways we analyze our results is by region, so as we enter 2008 it seems worth taking a look at the attitudes of voters in the Sandhills and southeastern North Carolina about next year’s candidates. For much of the year Fred Thompson has been the leading Republican for President in the region. He had a solid lead in the polls for this part of the state as recently as November. But the surge of Mike Huckabee’s candidacy has badly hurt Thompson’s standing. In the most recent poll Huckabee led with 39% followed by Rudy Giuliani with 21% and Thompson fell to third at 15%. On the Democratic side Hillary Clinton has been the top choice among local respondents by a significant margin even with native son John Edwards in the race. Her leads over him in the region were 38-21 and 40-21 in the last two polls. When it comes to polling for the general election though, Edwards is the Democrats’ best hope. Hillary Clinton and Barack Obama would both be soundly defeated in southeastern North Carolina by any Republican nominee out of frontrunners Huckabee, Giuliani, and Mitt Romney. But if the Democrats choose John Edwards, the race tightens considerably. He would be tied 49-49 against Huckabee, would trail Giuliani 50-48, and would have a 51-44 deficit against Mitt Romney. The only way there will be a close race in this part of the state is a John Edwards nomination. In the Governor’s race Bev Perdue is the Democrat of choice, not particularly surprising given that she hails from eastern North Carolina. She has had a double digit lead over opponent Richard Moore each of the last three months. On the Republican side, Bill Graham, a trial lawyer and native of Harnett County has led for most of the year. But there has been a recent increase in support for Fred Smith, a senator from Johnston County. The most recent poll shows Smith leading Graham by a tight 26-21 margin in the region. When it comes to the general election though, pretty much any of the Republicans would start with a strong leg up on the Democratic nominee. The four potential GOP nominees (Charlotte mayor Pat McCrory and former Supreme Court judge Bob Orr in addition to Smith and Graham) lead seven out of eight potential general election races in southeastern North Carolina. The only exception is a tie between Perdue and Smith. When it comes to the Governor’s race the results in the region are pretty out of line with the rest of North Carolina, which shows Bev Perdue winning against all four possible Republican opponents and Moore victorious in two out of four matchups. But this is not surprising given that southeastern North Carolina has tended to be a pretty Republican area in recent years. 2008 is looking to be a better year for Democrats in North Carolina than most in recent memory. Our polls show that if John Edwards was the presidential nominee he would likely win the state, and although Barack Obama and Hillary Clinton are trailing the margins are not as bad as they have been for most Democratic nominees in the last few decades. That trend makes it even more important than usual for Republicans to work hard to get out their voters in places like southeastern North Carolina that tend to be more favorable to their candidates. The election is a long way off but there will surely be a flurry of political activity in this region next year. What's more important, going to church or going to a Nascar race? This kind of question just feeds into stereotypes that Yankees have about North Carolina. Apparently we don't do anything but go to church and watch Nascar. You'll be stunned to know, I am sure, that Rasmussen is a New Jersey company. Well I hope Rasmussen will remember that a Carolinian man don't need him round anyhow. This is just another piece of confirmation that McCrory would be the strongest GOP candidate in the general election. But I don't think he will win a primary dominated by conservative voters. I am a little skeptical of their numbers on the US Senate race. For one thing, they have Elizabeth Dole with a 58% favorable rating. That is way better than any other recent poll has showed her with. PPP and Research 2000 both showed her favorable rating last week at 46%. In a matchup with Kay Hagan, they have her leading 55-35. This is also much better than both PPP and Research 2000 showed- we had it at 51-39 and Research 2000 had it at 46-39. Hard for me to do much analysis of this poll because they didn't provide their wording for the horse race questions (did they describe the candidates' background or current positions in any way?) and also because they did not provide crosstabs so we have no idea what the partisan background of their sample was. The Triad is shaping up to be one of the most Democratic regions in the state for the 2008 election, according to recent surveys conducted by Raleigh’s Public Policy Polling. In the races for both President and Governor, Democratic candidates appear primed to win almost any general election matchup. Public Policy Polling has conducted monthly polls in 2007 about the various statewide races we will have in North Carolina next year. One of the ways we analyze our results is by region, so as we enter 2008 it seems worth taking a look at the attitudes of voters in the Triad about next year’s candidates. In the Democratic presidential race, John Edwards and Hillary Clinton have gone back and forth in the top spot among respondents in the Triad. Clinton led in the region in September and November while Edwards had the advantage in October and December. On the Republican side Fred Thompson had a large lead after announcing his candidacy in September but saw it dwindle each month until Mike Huckabee took the lead over him this month 38-18. The poll coincided with Huckabee’s visit to Greensboro for a fundraiser. It appears that regardless of who the Democratic and Republican nominees are the Dems will have a strong advantage in the region in the general election though. John Edwards particularly appears to be a strong candidate. He earns the support of over half the folks in the Triad against all three Republican front runners, even with the undecideds factored in. Clinton and Obama also lead potential races against Huckabee, Rudy Giuliani, and Mitt Romney but the races would be much closer if either of them was the nominee. The Triad has been one of the closest areas in the state when it comes to the contest to decide who the Democratic nominee for Governor next year will be. Bev Perdue has a lead on Richard Moore but it has just been 38-35 and 34-30 each of the last two months within the area. This is definitely a region that is up for grabs and that each candidate will have to work hard to earn support in over the next four months. On the Republican side, senator Fred Smith has come on strong in the last few months. As recently as September he trailed 23-8 when compared with Bill Graham, a Salisbury trial lawyer. But in the last two polls he’s taken leads of 29-16 and 31-15 throughout the Triad. Smith’s support has gone up significantly statewide as well on the heels of a BBQ tour that has included stops in Rockingham, Alamance, Surry, and Davie counties among other Triad locales. When it comes to the general election though, the Democrats look like the favorite in pretty much any possible matchup. Bev Perdue would lead all four possible Republican nominees (Charlotte mayor Pat McCrory and former supreme court judge Bob Orr in addition to Smith and Graham.) Richard Moore leads Smith and Orr, is tied with Graham, and has just a small deficit against McCrory in the Triad. The Triad is also notably the only region in the state where both Democratic Senate candidates, Kay Hagan and Jim Neal, lead Elizabeth Dole in our most recent polling. Hagan, a state senator from Greensboro, leads her home region 51-46 while Neal leads it 49-43. If the Democrats are going to reclaim that seat it will take high voter turnout from this high area of support. In addition to the races for President and Governor, we’ve also been polling for Lieutenant Governor and Treasurer. Each of those contests has a candidate from Forsyth County in it. Dan Besse, a Winston-Salem Councilman, is seeking the Democratic nomination for Lieutenant Governor. Dale Folwell, a legislator, is hoping to be the Republican candidate for Treasurer. Folwell in particular is getting a lot of support on the home front. Although he trails his opponent, Bill Daughtridge, by a small margin statewide he has led in the Triad 22-10 and 18-12 in the last two polls. Besse has been in fourth place statewide for most of the polls in his race so far and has also gotten his greatest support closest to home. He has led the Triad in two of the last four polls and finished second behind front runner Walter Dalton this month. Democrats in North Carolina are hoping to have their candidate for the presidency carry the state for the first time since 1976 next year, and it looks like the Triad would be an influential region in helping them do that. I think someone over at The Conservative Voice might have had a little too much eggnog to drink yesterday. Considering all the flak we get for our Democratic clients I'm not sure whether to be honored or bewildered or what at being mistaken as a Republican outfit. Kouri then goes on to quote another post I wrote earlier this month about how Fred Smith's rise in the polls coincided almost exactly with the launch of his statewide BBQ tour. No problem with that, except he attributes it to 'North Carolina political observer and blogger Lorie Byrd.' I 'd never heard of this woman but I googled her and she came up as being a columnist for townhall.com. That's, um, not a site I think I would contribute to. Thank you to the alert reader who made me aware of this whole thing. The region including Charlotte and its surrounding counties is set to be the strongest Republican area in North Carolina for the 2008 election, according to recent surveys conducted by Raleigh’s Public Policy Polling. The red tilt will be even stronger if Charlotte mayor Pat McCrory enters the race for Governor. Public Policy Polling has conducted monthly polls in 2007 about the various statewide races we will have in North Carolina next year. One of the ways we analyze our results is by region, so as we enter 2008 it seems worth taking a look at the attitudes of voters in the Charlotte region about next year’s candidates. Among Democratic primary voters, Hillary Clinton is the most popular candidate in the area. She has led three of the last four months and in the most recent poll had 43% compared to 23% for Barack Obama and 17% for John Edwards. It doesn’t really matter who the Democratic nominee is though. It appears that this is one part of the state where Republicans are set for a strong performance in 2008. In nine potential general election matchups for President, Mike Huckabee, Mitt Romney, and Rudy Giuliani lead Clinton, Edwards, and Obama in every one by pretty wide margins. Giuliani and Huckabee are particularly strong in the metro Charlotte region. Even factoring in all the undecideds they receive over 50% against any of the leading Democratic hopefuls. The way the gubernatorial race breaks in the area will be strongly dependent on whether Pat McCrory decides to run or not. Bill Graham, a Salisbury trial lawyer, has been by far the strongest candidate on the Republican side in the region all year. In the most recent Republican primary poll he led state senator Fred Smith 22-10, even as Smith took the lead on a statewide basis. But the same poll showed that if McCrory entered the race he would lead Graham 44-15 in the greater Charlotte area. A McCrory candidacy could pretty much be a death knell for Graham because it would cost his so much support in his home region. McCrory is even stronger in potential general election contests against Richard Moore or Bev Perdue than he is in the primary. The polling shows that he would lead Moore 62-16 and that his margin over Perdue would be 61-20. Although the other Republican candidates lead the two Democrats in the region as well they don’t come near cracking 50%. In the Democratic race for Lieutenant Governor, Walter Dalton and Hampton Dellinger have been the strongest candidates in the area. Dalton is a senator representing a district including Cleveland County who has run campaigns in this media market before. Dellinger is from the Triangle but has been endorsed by Charlotte City Council member Susan Burgess. Robert Pittenger, one of Mecklenburg County’s state senators, recently announced his candidacy for Lieutenant Governor. He has very strong support for that position in the region, leading his opponent Greg Dority 44-9 in the first poll. He should be grateful for the local support because he doesn’t exceed 10% in any other region of the state. The election is a long way off but if the current polling trends hold true, the Charlotte region could be key to the efforts of Republicans to regain the Governor’s mansion and continue North Carolina’s thirty plus year tradition of choosing Republican candidates for President. That’s because statewide it’s looking like a good year for Democrats. John Edwards appears to be the strongest general election candidate in North Carolina of either party for President and although Barack Obama and Hillary Clinton would not be favored in the state it still appears either of them would do better than most Democratic candidates have in recent years. This Democratic turn in the electorate makes the Republican stronghold in the Charlotte region even more important to their party’s success than it normally would be. You can bet a lot of GOP resources will go into getting as many of its voters to the polls in this area as possible. It’s shaping up to be a pretty Democratic year in eastern North Carolina as long as the presidential nominee is John Edwards or Hillary Clinton, according to recent surveys conducted by Raleigh’s Public Policy Polling. Public Policy Polling has conducted monthly polls in 2007 about the various statewide races we will have in North Carolina next year. One of the ways we analyze our results is by region, so as we enter 2008 it seems worth taking a look at the attitudes of eastern North Carolina voters about next year’s candidates. Edwards or Clinton would lead all three of the top Republican contenders- Mike Huckabee, Rudy Giuliani, and Mitt Romney- in eastern North Carolina if the presidential election was today. Edwards would be a particularly strong candidate. He leads Romney 61-39, Huckabee 58-33, and Giuliani 50-36 in the region. Barack Obama appears to be the weakest potential Democratic candidate in eastern North Carolina. He loses potential contests against all three Republican candidates. Ironically though, he was the top choice of Democrats in the eastern part of the state in the most recent poll for primary voters, earning 29% support compared to 27% for Edwards and 20% for Clinton. It’s a situation where Obama may be the most popular choice for Democrats in the region, but Edwards is their best shot at regaining the presidency. In the race for Governor if there’s one thing that’s clear it’s that eastern North Carolinians love their native daughter, Bev Perdue of New Bern. Month after month she leads her primary opponent Richard Moore by large margins in the eastern part of the state, with margins ranging from 17 to 26% in polls over the last four months. Her lead has usually only been in the single digits on a statewide basis so her very strong performance in the eastern part of the state could be key for snagging the Democratic nomination. On the Republican side, state senator Fred Smith from Johnston County trailed trial lawyer Bill Graham for most of the year in the region but has recently taken the lead. Smith has been working hard to court eastern North Carolina voters. Just in the last month he has appeared at events in Lenoir, Greene, Edgecombe, Nash, Chowan, and Hertford counties as part of his statewide BBQ tour. That hard work has paid off with his standing going to 25% compared to 10% for Bob Orr and 8% for Bill Graham in the most recent poll of the primary. When it comes to the general election though, Bev Perdue is the candidate of choice. Her lead in eastern North Carolina ranges from 26 points over Fred Smith to 31 points over Bill Graham. Since her leads over the three announced Republican candidates only range from 4 to 9 points across the whole state of North Carolina, her strong standing in her home region will be a key factor in whether she is successful or not. There are several Republicans from eastern North Carolina running for statewide offices and early polling shows each of them doing very well in the primary on their own turf. Bill Daughtridge, a legislator from Rocky Mount, is seeking the nomination for Treasurer against Dale Folwell of Forsyth County and has a double digit lead in the polls in this part of the state. That has allowed him to take a small statewide lead. Greg Dority of Washington, who has previously run for Congress against G.K. Butterfield, is seeking the office of Lieutenant Governor. He has a one point lead over senator Robert Pittenger of Mecklenburg County for the first poll conducted in that race and that slight advantage is easily attributable to the 14 point lead he has in this part of the state. Eastern North Carolina is a region that is ancestrally Democratic and still has a high percentage of registered Democrats. The voting trends in recent years though have been more toward the Republican side. Based on the current polling it looks like in 2008 the shift could be back toward the Democrats, particularly if their nominees for President and Governor are John Edwards and Bev Perdue. If that does turn out to be the case, doing a good job of getting out the vote in this region will be a key to Democratic success in North Carolina next year. There is no clear favorite on environmental issues between Bev Perdue and Richard Moore. They both have fine but not earth shattering records. So the support of environmentalists is one constituency group either of them could attract the support of by showing some strong leadership in the campaign. The biggest non-drought related issue out there right now is the air quality permit for the proposed Cliffside coal fired power plant on the border of Cleveland and Rutherford counties west of Charlotte. The usual environmentalist suspects have come out against it. That's not exactly breaking news. But the EPA and the National Park Service- in this Republican administration- both have their qualms about it as well. Now that is not what you would have expected. The Charlotte Observer wrote a great editorial yesterday saying it's time 'to put the brakes on Cliffside.' Will either of our Democratic gubernatorial candidates show some leadership and join them? Our politicians tend to be pretty risk averse when it comes to antagonizing the utilities. One of the candidates speaking out on this issue would make a pretty strong statement that they deserve environmentalists' support. 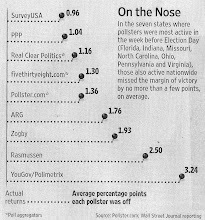 Note: As we head toward 2008, PPP is writing a series of columns for newspapers across the state outlining what our polls have shown in their region in 2007. We'll be posting these over the next week. First up is Western North Carolina. John Edwards and Mike Huckabee are the most popular Presidential candidates in their own parties in western North Carolina, according to recent surveys conducted by Raleigh’s Public Policy Polling. But Rudy Giuliani is the most popular candidate with the public at large in WNC. Public Policy Polling has conducted monthly polls in 2007 about the various statewide races we will have in North Carolina next year. One of the ways we analyze our results is by region, so as we enter 2008 it seems worth taking a look at the attitudes of WNC voters about next year’s candidates. On the Democratic side, John Edwards has been more popular with his home state voters in western North Carolina than any other region of the state. Hillary Clinton has led in many state wide polls of Democrats, but Edwards has led in the mountains nearly every month, most recently leading Clinton 38-34 in a December poll. Interestingly Barack Obama has earned very little support from people likely to vote in the Democratic primary in the region, always finishing well behind Clinton and Edwards among WNC voters. For the Republicans, Fred Thompson was the top candidate for most of 2007 but his standing has fallen to third. Mike Huckabee, who recently visited western North Carolina, took a large lead over Rudy Giuliani in the most recent poll. Huckabee had 34% to 19% for Giuliani among Republicans in the mountains who responded. Edwards and Huckabee might be the most popular candidates with each of their parties, but the candidate who would fare best in a general election in WNC is Rudy Giuliani. Public Policy Polling tested nine possible matchups for the presidency and found that he would lead Hillary Clinton and Barack Obama by large margins in the region if either of them was the Democratic nominee. Giuliani’s lead over Edwards was just 51-44, and the poll showed that the former senator from North Carolina would beat either Mike Huckabee or Mitt Romney in the mountains if either of them ended up being the choice of the Republicans. In the Democratic race for Governor, Lieutenant Governor Bev Perdue had a big lead in the region over Treasurer Richard Moore in September but has seen the margin decline every month since to the point that Moore led Perdue 35-30 in the December poll. So far Perdue has led all of the polls on a statewide level. Neither of the candidates has shown much interest or spent much time traveling to western North Carolina so far during the campaign so the region is probably up for grabs to the candidate who works harder to court the support of mountain voters in 2008. One candidate who has been traveling regularly to the region is senator Fred Smith, one of the Republican candidates for Governor, who has attended numerous BBQs on his behalf in small towns over the last few months. After finishing third behind opponents Bill Graham and Bob Orr in our September poll, Smith has taken the lead by increasingly greater margins in our last three polls. Traveling to places like Brevard, Robbinsville, and Marion has clearly helped his standing with WNC Republicans. Several Democratic candidates from western North Carolina seeking statewide office are getting a good deal of support from voters in their neck of the woods. Buncombe County commissioner David Young, who is running for Treasurer, has been basically tied in the statewide polls with his main opponent, senator Janet Cowell from Wake County. But in the mountain region, Young has a significant lead. Another statewide candidate from the area is Canton mayor Pat Smathers, who is seeking the office of Lieutenant Governor. He has been running a narrow second in the polls behind senator Walter Dalton of Rutherford County, but has received the greatest amount of support from his home region in most of our polls. It’s early but it is clear that from the top of the ballot on down the way western North Carolina votes could have a significant impact on who wins the statewide races next year. As a region where neither Democrats or Republicans dominate the vote, candidates in close races will need to take it seriously to come out on top. In the presidential race, Hillary Clinton has taken some heat lately for running a cautious, 'incumbent' style campaign, as if she already holds the office. In the North Carolina Lieutenant Governor's race Walter Dalton is doing the same thing. The most public recent example has been a series of debates and questionnaires that Dalton has eschewed. Take the recent Progressive Democrats of North Carolina forum. Just about anyone involved in North Carolina politics could have told you 12 months ago that the Progressive Dems would endorse Dan Besse. But Pat Smathers and Hampton Dellinger attended the forum and answered the questionnaire anyway, because when you are running for office part of what you do is engage with the electorate, even if the outcome isn't likely to go your way. Walter Dalton? He didn't attend the forum or answer the questionnaire. A series of six debates on college campuses across the state has been proposed. Dan Besse and Pat Smathers have agreed to participate in all of them and Hampton Dellinger has too, pending some scheduling issues being cleared up. Dalton? He vaguely says he'll debate when the time comes. Refusing to engage with other candidates or appear at events sponsored by Democratic organizations are the kinds of things you do if you think you're way out ahead of the pack and can get by with just spending a lot of money on tv. Dalton has to be banking that media attention will be so diverted to the gubernatorial and senate primaries that he will be able to get away with this kind of disengagement without the broader mass of voters becoming aware of it. It might just work. With the financial resources he has available to him, he will surely finish in the top two. A key player in this equation is the editorial boards of newspapers across the state. The influence of newspaper endorsements has waned over the years, but they're more likely to be important in a primary where not a lot of attention has been paid to the race. One of the main things the media is supposed to value is open and honest debate. If Dalton does not engage in that over the course of the campaign, he should get raked over the coals when it comes time for influential newspapers to do their endorsements. It could be a difference maker in whether he is able to get away with his incumbent strategy or not. Daily Kos commissioned a poll on the North Carolina Senate race. It was conducted by Research 2000 Sunday, Monday, and Tuesday nights so it's actually a little fresher than the Senate numbers we released on Monday. In the possible matchups they have Dole leading Kay Hagan 46-39 and leading Jim Neal 47-37. The level of support they're showing for Hagan and Neal is the same as it was in our poll but we had Dole performing a little better- 51-39 against Hagan and 52-37 against Neal. Of course I hope their poll is more correct than ours on that front. The poll also shows the President's approval/disapproval rating at 42/57. Not so hot for him. Check out their full poll results here. Ok that's not exactly breaking news. Republican, press 2. If other, press 3. That would be a fair point...if it were true. The party breakdown of our statewide general election tracking poll was 47-39-15. But the breakdown on our separately conducted 10th Congressional District poll was 51% Republicans, 37% Democrats, and 12% others, actually more Republican than what this person seemed to think we should have had. Of course in many parts of North Carolina the Republican leanings of the electorate are stronger than what the registration numbers would seem to indicate, and the 10th District is one of those places where that is historically the case. Folks, you can attack us all you want but you're going to make yourself look pretty stupid if you don't make sure you know what you're talking about first. I know it's upsetting to see McHenry's poll numbers going down but there are better ways to cope with it! Laura Leslie, who does an outstanding job covering state government for WUNC, wrote an interesting post last night on her blog about our polls and the margin of error. Every matchup except one (Moore-Smith) fell within the 4.5 (times 2 remember) margin of error, which means it’s a statistical draw. McCrory and Graham got higher numbers than Moore in their match-ups against him, although with the MOE, it’s a tie all 'round. That the races are a statistical draw is sort of, but not entirely, true. There are two problems with this: first, 95% is not some kind of magic cutoff point, and second, the idea that the MOE represents 95% certainty is wrong anyway. A poll's MOE does represent a 95% confidence interval for each individual's percentage, but it doesn't represent a 95% confidence for the difference between the two, and that's what we're really interested in. In fact, what we're really interested in is the probability that the difference is greater than zero — in other words, that one candidate is genuinely ahead of the other. But this probability isn't a cutoff, it's a continuum: the bigger the lead, the more likely that someone is ahead and that the result isn't just a polling fluke. So instead of lazily reporting any result within the MOE as a "tie," which is statistically wrong anyway, it would be more informative to just go ahead and tell us how probable it is that a candidate is really ahead. Bev Perdue's two point lead over Pat McCrory means there's a 66% chance she's leading him. Her four point lead over Bill Graham means there's a 79% chance she's leading him. Her six point lead on Bob Orr means there's an 89% chance she's leading him. And it's higher for Fred Smith. On the polls involving Richard Moore, his two point deficit against Bill Graham means there's a 66% chance Graham is in the lead. Same odds with Pat McCrory, who he also trails by a couple points. His margins over Fred Smith and Bob Orr are large enough to get to close to a 100% chance that he's leading them. Anyway check out the article and the chart, it's an interesting read. Wrapping up, to quote Kevin Drum again, “from a pure statistical standpoint, a lead is a lead and it's always better to be ahead than behind.” Even when two candidates are within the margin of error, it doesn’t mean that no one is leading. Bev Perdue has been perceived as the front runner for Governor next year in many circles and our first round of general election polls seems to confirm that status...but it's a lot closer than many might have expected. Perdue leads against all four potential GOP nominees for Governor. She has solid margins against Fred Smith and Bob Orr but it's pretty close against Pat McCrory and Bill Graham. One thing that seems to be clear from the numbers is that Perdue is the candidate who makes it easiest for voters to make a decision- both for and against. She gets a higher percentage of support than Richard Moore against every Republican opponent. But the various Republican candidates all get a higher percentage of the vote against her than Moore as well. There are a lot fewer undecided respondents when Perdue's in the mix, probably because she's the best known candidate and the one voters are most likely to have a strong opinion about one way or the other. McCrory looks like the Republicans' strongest candidate. Not only does he hold a slight lead against Richard Moore, but he pulls a good chunk of the Democratic respondents- 16% against Perdue and 18% against Moore while Fred Smith, currently leading in our polls for the primary gets only 7% and 6% of the Democratic support against Perdue and Moore respectively. Greater support for Perdue than Moore among women is the key to her leading Graham and McCrory while Moore trails. Perdue leads McCrory by 11 points in that demographic while Moore's lead is just 4. Against Bill Graham, Moore trails by two points among female respondents while Perdue leads by six. Clearly there are some political benefits to Perdue's status as the most viable female candidate for governor North Carolina has ever seen. Another key area of strength for Perdue relative to Moore is among African American respondents. While Perdue polls at 70% or above in all four match ups in this key Democratic party demographic, Moore's performance ranges from 43-57% with a good deal of undecideds. Moore may not be as well known as Perdue right now to African American respondents, but he will likely perform as well as Perdue with black voters if he does end up receiving the nomination. White voters prefer the Republican candidate in six out of eight possible contests. Moore is more popular than Perdue among white voters in all of the match ups except the ones against Pat McCrory. Regionally the only big disparities between the races are Perdue's strong performance in eastern North Carolina relative to Moore and McCrory's strong performance relative to the other Republican contenders in the Charlotte area. While the Republican candidate draws 31-43% of the support in the other six match ups, McCrory gets over 60% against both Moore and Perdue in his regional base. In the east Moore gets 34-44% in all four of his match ups but Perdue clears 50% in all of them. Bottom line: with four out of six candidates leading in at least one of these polls the race is wide open. -John Edwards' strength comes from receiving higher level of support among both Democratic and Republican respondents. Edwards gets the support of 79-85% of Democrats against each potential opponent while Clinton gets 73-77% and Obama gets 69-73%. Obviously no Democrat is going to win for president in North Carolina without getting the vast majority of votes from his/her party. Edwards gets the support of 12 to 15% of Republican voters against his possible foes. That's not a lot but it's better than the 9-13% that Obama carries and the minuscule 4-7% showing among Republicans that Hillary Clinton has. Even a little crossover support is what it could take for a Democrat to carry North Carolina for the first time in 32 years. -In all of the races Democrats perform strongly in the Triangle, Triad, and Northeastern North Carolina while the Republicans do better in the Mountains, Charlotte area, and Southeastern North Carolina. Elizabeth Dole crosses the 50% mark for the first time in potential matchups with Kay Hagan and Jim Neal, according to our most recent poll. Her approval rating remains below 50 though, at 46%. Dole's approval rating is the highest it's been in a PPP survey since August. Since announcing their candidacies Neal and Hagan have largely focused their time on fundraising and reaching out to core Democratic groups and constituencies that are important for winning the primary. These things are important but wouldn't translate into increased support in a poll testing general election matchups. Although Dole's going over 50% should certainly be a cause of concern for their campaigns there's no need to panic at this point, as long as they start building up their visibility to the public at large soon. John Edwards would be the strongest general election candidate for President in North Carolina, according to our newest poll. That may seem obvious to folks outside the state, but Hillary Clinton has actually been leading most recent polls in the state for the Democratic primary. The reality in North Carolina, like many other states, is that while a majority of Democrats may prefer Clinton or Barack Obama, Edwards is their surest ticket to reclaiming the White House. Giuliani and Huckabee appear to be roughly equal in performance as potential Republican nominees. Romney is slightly weaker. Obama does slightly better than Clinton in all three potential general election matchups. Pat McCrory is so new to the possibility of joining the Governor's race, he doesn't even know who he's running against! He released an internal poll yesterday that showed him leading Bev Perdue in a potential general election matchup, 39-36. The interesting part of the poll though was that it showed Dennis Nielsen getting 4% of the vote as an independent candidate. The problem is that Nielsen is seeking the Democratic nomination. I think McCrory is the Republicans' best shot at regaining the Governor's mansion, although winning the primary will be tough. But things like not even knowing what the field looks like for the race is just another indication that his Charlotte-centered mentality and seeming inattention to the rest of the state could be tough to overcome. BTW, one reason that McCrory is regarded as such a strong contender is that he has earned a lot of crossover support from Democrats at the polls during his time as Mayor. I don't know if that will translate to a gubernatorial race or not. But read this Charlotte Observer editorial and then tell me how good he would be at working with a Democratic legislature. The Capital Press Corps would have a field day for four years with all that bickering. It's been a busy couple of weeks around here! Civitas is stressed about our transit poll, which we're always happy about. More coverage here, and here. Our ACC loyalty poll generated a lot of discussion in various parts of the universe. Folks are also happy about our poll showing Patrick McHenry's vulnerability. And there were too many links to post them all here but there was a lot of interest in our tracking polls last week. Earlier this week I wrote about how Bill Graham's standing in our polls relative to Fred Smith had dropped precipitously in the last three months. Yesterday someone asked me why Civitas still showed him in the lead in their poll last month as he has declined in ours. I don't have a definite answer but I do have a theory. Earlier this year, BlueNC blogger Jim Protzman posited that Graham was doing well in early opinion polls because people were mixing him up with the Reverend Billy Graham. I hadn't thought about that in a while but when I wrote my post about candidate Graham's drop in the polls earlier this week I got several hits on the blog off of google alerts- from Billy Graham Ministries! How does this relate to Civitas? Well we only poll likely primary voters when we do our primary tracking polls and I think most folks who care enough about politics to vote in a primary know by now that the Reverend Billy is not running to be the Governor of North Carolina. But Civitas polls likely general election voters and many of them might not have followed the race closely enough so far this year to know the difference. For most of the year Civitas has identified each of the candidates by their background when doing their polls, so folks would have known that it was Trial Lawyer Bill Graham rather than the Reverend Billy Graham. But it doesn't look like they used those tags for their November poll. So that's my theory, at least for now. One of the biggest reasons Patrick McHenry's standing has fallen in the next four months has been increased ambivalence about him from his fellow Republicans. His approval rating dipped from 73% in August among Republican respondents to just 63% in December. His reelect number went from a strong 77% from his fellow party members down to 65% over the four month period. When presented with the background of McHenry's Democratic opponent, Daniel Johnson, McHenry's standing fell even further, to below 60%. That's tenuous territory for an incumbent with members of his own party. Today Public Policy Polling released the results of a poll conducted in August and then again this week about the 10th Congressional District race. The results clearly show voters becoming more ambivalent about Patrick McHenry's job performance over the last four months and open to the possibility of electing someone else in 2008. Do you approve or disapprove of the way Patrick McHenry is handling his job as Congressman? While McHenry's disapproval numbers have remained static the number of people approving of his performance has declined 9%. It seems that allegations of misconduct by both McHenry and his staff are causing voters in his district not necessarily to disapprove of him but to be more wary of the job he is doing. In 2008 Patrick McHenry will be running for a third term as Congressman. If the race were today would you vote to reelect Patrick McHenry or would you choose someone else? In August a solid majority of respondents in McHenry's district said they would vote to reelect him. Since then the number of people definitively saying they would do so has declined from 55% to 45%, with the number of people unsure going from 11 to 19%. Daniel Johnson, a conservative Democrat and 31-year-old prosecutor from Hickory, who was awarded the Navy and Marine Corps medal after losing both of his legs while saving the life of a fellow sailor, is challenging Patrick McHenry. If the election were today, who would you vote for? Since Daniel Johnson got into the race there has been a significant uptick in the number of voters who are undecided about who they will vote for. This shift has been particularly strong among Republican voters. In August 17% of Republican respondents were undecided about who they would vote for. That number is now up to 28%. It is likely that since announcing his candidacy the contrast between Johnson's background as a prosecutor and military hero has been more appealing to many Republican voters than McHenry's life in politics. But they're still Republicans and hesitant to support a Democrat. Daniel Johnson can be successful if he can convince those undecided Republicans to cross party lines. Not surprisingly, Democrats are more supportive of new funding sources for mass transit than Republicans are. But Republicans are not as unfriendly to it as you might think. 73% of Democrats supported some new form of revenue, compared to 16% who did not think there should be any new money for mass transit projects. For Republicans the numbers were 47% in favor of one of the three funding options presented with 45% opposed to any new money. There is a significant gap between Democratic and Republicans responses but I would have expected a majority of Republicans in the Triangle to be opposed to new transit funding. There was a significant gender gap in the results as well. While only 22% of women opposed any new funding sources for transit projects, 36% of men were. Not surprisingly, Orange County residents were the most supportive of mass transit among the people we polled followed by Durham County residents and Wake County residents. So the spread was 73%-19% in support of doing something. The spread was 63% to 30% in support of some new money for mass transit. 60% to 30% in support of new taxation for mass transit. Do you think traffic congestion in the Triangle is a problem? Some people think that the solution to traffic congestion is building and widening more roads. Others believe we ought to develop a variety of transportation options, including roads, regional bus service, and regional rail. Which approach makes more sense to you? It's worth noting that we asked this same question on a survey conducted in April 2006. At that time the margin was 70%-23% on this question, indicating there may be slightly more support for mass transit in the Triangle than there was this time 20 months ago. Last month Mecklenburg County residents voted to continue a half cent sales tax for mass transit to relieve road congestion. If you thought it would help with traffic congestion, would you support a similar tax for counties in the Triangle? Another way mass transit could be paid for is a $40 per year increase in the vehicle registration fee. If you thought it would help with traffic congestion, would you support an increase in the vehicle registration fee? Another way mass transit could be paid for is an odometer tax at the annual vehicle inspection. Vehicle owners would be charged five dollars for every thousand miles driven in excess of 12,000 miles per year. If you thought it would help with traffic congestion, would you support an odometer tax? Another way mass transit could be paid for is a ten cent increase in the gas tax. If you thought it would help with traffic congestion, would you support an increase in the gas tax? What would be your preferred way of generating new money for mass transit projects in the Triangle; a sales tax increase, a combination of a vehicle registration fee increase and odometer tax, a gas tax increase or do you oppose any new money for mass transit? What's the bottom line? 63% of respondents are willing to pay more for mass transit. That's a good sign for the Special Transit Advisory Committee, which is working on recommendations for a Regional Transit Vision Plan which will surely need to be funded. But it's not clear what mode of taxation would be most palatable to Triangle residents, although it does seem that raising the gas tax would not be a popular solution in this time when prices are already high. It's up to our leaders to come up with a plan that they can get majority public support for- but having the support for transit in place from the public is an important first step- and that appears to be the case from our poll.